There I discovered two new (for me) ideas, one revolutionary, and one downright shocking. This idea involved weaving about an inch of plain weave and then inserting a first stick in the one shed and then a second stick in the next shed. The attraction here was that it is supposed to even out irregularities in the warp tension. Since I’ve had an ongoing battle with tension (and indeed, it was the primary factor to convince me to try b2f warping) I decided to give this a try. After all, if I didn’t like whatever happened, I could always unweave and take it out. So I started with my usual 3 unbeaten shots, beat, and continued in plain weave. I had two leftover warp separator sticks which were just the right length. I carefully positioned the first, beat and changed sheds, and positioned the second. I continued weaving and as promised, all the potential trouble spots had evened out beautifully! I was delighted. “This idea is a keeper,” I thought. This one involves cutting off the knots and retying the warp to the front apron rod after the 2-stick heading is in place. (WHAT!!!!!!!!!!!!?????????!!!!!!!!!!!!). I had to stop reading because I didn’t think I could handle that. The 2-stick heading was one thing, but idea #2 would be irreversible once that warp was cut. I could envision my beautifully tensioned 5 yard warp lost forever. Even though I had good success with cutting my tie fabric (see “Log Cabin Necktie” May 15, 2006) I decided to tape the header cloth “just in case.” This will be yardage, so I don’t need the fringe. If I had wanted fringe however, I would simply untie the slip knots I used to prepare the warp for lashing onto the apron rod. I wove a little more of my header weft to even it out. Taking into account the lens distortion of my camera, I’m pleased with my first five inches. Now I can relax and enjoy weaving! Instead of tape, I've heard of weavers putting a bead of super glue across the warp. I haven't tried it, but find the idea intriguing. Your fresh warp looks wonderful. I don't think there is anything as satisfying and inviting as a freshly tied on warp! Looks great! You must have nerves of steel! 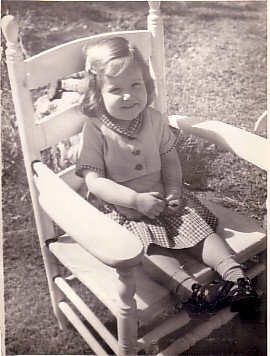 Then again, I felt that way before I cut my first steek. You just have to fortify yourself and do it. Leigh, you are just getting way too brave! 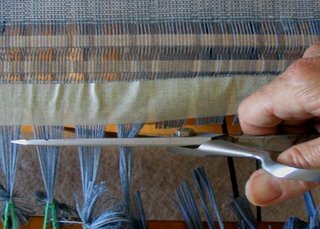 To date I have used that two-stick heading trick only when I need to cut off something that is woven but have more warp to weave, or when I tie on with a dummy warp. I too was terrified the first time I did that! And, like you, was so happy to see how well it worked. So far as using it at the beginning to even out the tension, I have found that throwing plain weave shots does that quite nicely. I can see all the different warp threads bunching up in places and after a bit, they are all nicely even. Brave indeed! I may give this trick a try when I feel equally brave.